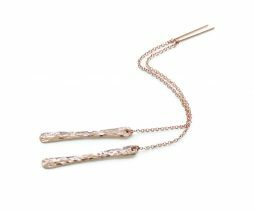 Rose gold bar earrings, fashion threader earrings. Threader earrings in rose gold, minimalist, geometric style bar earrings. Super long gold cable chain threaders. Artisan, handmade earrings, jewelry trends. Modern geometric jewelry, graduation gifts. Great gift! Rose gold filled bars are hammered and made by hand, 1 1/4″ or 32 mm long. The earrings itself are 3 1/4″ or 83 mm long. Abstract handmade earrings, knotted bar earrings in sterling silver. 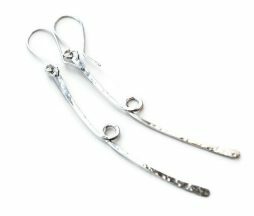 Unique abstract earrings, 3 inch long knotted bar earrings in sterling silver. Hand forged, hammered, knotted bars. Edgy, trendy style. Handmade sterling silver ear-wires. Total length of earrings is 3″. Handmade rose gold hoop earrings. 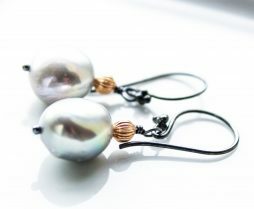 Organic shape, rose gold filled earrings. Simple, stylish everyday hoops. 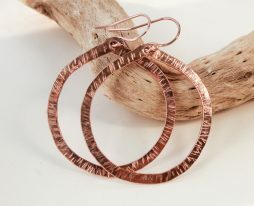 Handmade organic rose gold hoops – great gift for every occasion. 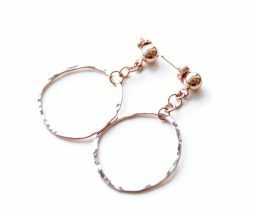 Earrings are made of thick rose gold filled wire, hand forged and slightly marred with hammer. Circle, slightly organic shape. Earrings are 1 1/4″ big or 32 mm. Shipping: Worldwide shipping from Toronto, Canada. Artisan hoop earrings made of 14k gold filled and sterling silver. Gold filled hammered simple hoops with sterling silver ear-wires. Gold filled wire is hammered and hand forged, polished to a high shine. The diameter of the hoops is 1 1/16″ or 27 mm. 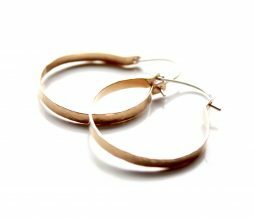 Rose gold organic shape hoops. Ball post simple, everyday earrings. 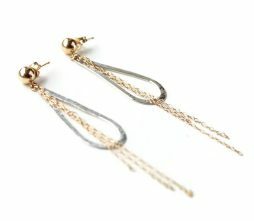 Modern teardrop earrings in gold and sterling silver. Extra long chain earrings. Earrings are made of gold filled and sterling silver and are 3″ long. 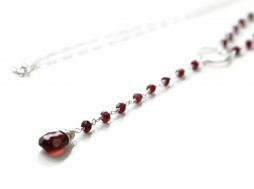 Modern Y necklace in sterling silver with Garnet gemstones. January birthstone gift. The length of the necklace is 20″ to the silver ring and the drop part is 4.5″ long. 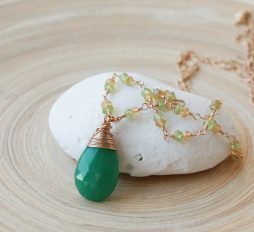 The Fortune necklace – Chrysoprase, Citrine and Peridot long necklace. May birthstone gift. Chrysoprase necklace in gold filled. Wire wrapped Chrysoprase gemstone drop, Citrine and Peridot small, round gemstones. May birthstone gift, graduation gift. Chrysoprase gemstone is 20 mm x 13 mm big, wire wrapped in gold filled wire. Small Peridot and Citrine beads in light green and orange make a beautiful color combination. Gold filled chain with long and short links.